Yo ho, let's go! Set sail with Jake and his crew on a full-length, high-speed adventure on the high seas. According to the Never Land pirate code, Jake and his crew must race Bucky against the Jolly Roger and the sneaky Captain Hook. But if Bucky loses, he'll belong to Hook forever! Of course, Hook uses every trick in the book and wins the race! But, Jake and his crew might have a way to get Bucky back. With the help of Peter Pan, the young pirates embark on an adventure across Never Land that includes getting past a fire-breathing dragon! 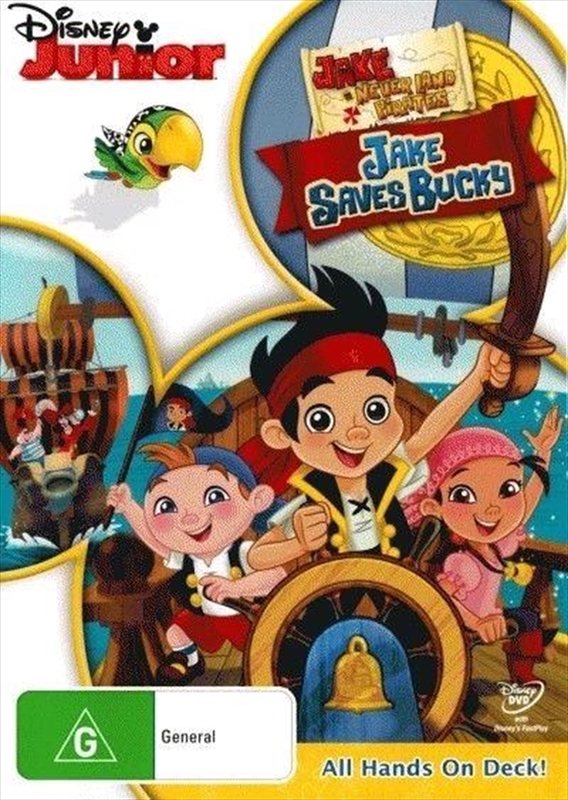 With your help, Jake's crew can save Bucky from the devious Captain Hook! Also, enjoy four more exciting Jake And The Never Land Pirates episodes! Overflowing with music, swashbuckling action, and seafaring fun, Jake Saves Bucky proves that being a hero comes from teamwork, determination, and friendship!